Last night as I was on a high as I left my Eden Prairie String Academy dress rehearsal at the Historic Wesley Center for our Sunday concert and I saw something that made me sick. There were people walking from that new and improved music hall on the corner of 11th and Nicollet to the parking ramp and hundreds of kids wearing choir robes outside. What the heck was going on. The Musicians of the Minnesota Orchestra have been locked out from playing at that hall since October 1, 2012…That’s one year and 42 days…407 days as of last night. As I drove to my rehearsal last night it was one of the 1st time I’ve seen the “new hall”, I thought to myself…”Dang…when is this thing going to get resolved so our musicians can get back to playing GREAT music. Then as I’m driving away from my rehearsal I see what…a concert…just getting over at THAT place. NO WAY…WHO…WHAT group would have the guts to play at that hall when our Minnesota Orchestra Musicians CAN’T. I saw a couple of buses that said Robbinsdale. I went home steaming and did a little google search and found that was the Robbinsdale District Fall Music Festival. WHY would a group choose that venue. A venue where teachers of probably some of the student’s are LOCKED OUT from playing…There are several other halls in the area that can hold a festival of that magnitude. Why even Bill Cosby cancelled his performance this past September at that place. Groups such as the Minnesota Youth Symphonies, Greater Twin Cities Youth Symphonies, Minnesota Boy’s Choir, Minnesota Chorale , Metropolitan Boys Choir have all presented concerts there in the past and all have found other venues during this difficult time. Why I know it’s a lot of work to change a venue and a lot of people are involve, it’s not like this is a new thing going one. 407 days folks…other groups have moved. If it would have been me, I certainly would have looked into other options…Ordway, Benson Great Hall, Wooddale Church just to name a few places that could accommodate that sort of festival! 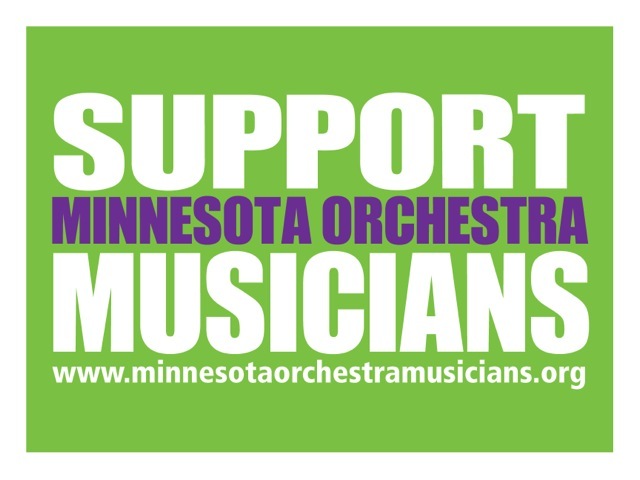 Please everyone…support the Musicians of the Minnesota Orchestra and don’t go to that place until we get our orchestra back in their hall!